environmentalist and traveler. (I ,Steve Ray who is posting his article, was born in Detroit. My ancestors lived there since the 1700’s.) I posted this a while ago but thought it worth revisiting again with Detroit recently in the news. 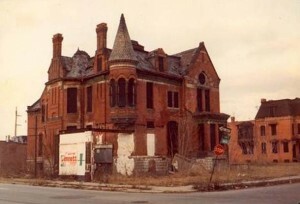 For 15 years, from the mid 1970’s to 1990, I worked in Detroit, Michigan I watched it descend into the abyss of crime, debauchery, gun play, drugs, school truancy, car-jacking, gangs, and human depravity. I watched entire city blocks burned out. I watched graffiti explode on buildings, cars, trucks, buses, and school yards. Trash everywhere! A new child meant a new car payment, new TV, and whatever mom wanted. 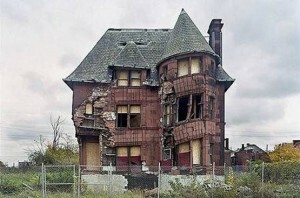 I saw Lyndon Baines Johnson’s ‘Great Society’ flourish in Detroit . If you give money for doing no thing, you will get more hands out taking money for doing nothing. Detroit plummeted from 1.8 million citizens to 912,000 today. At the same time, legal and illegal immigrants converged on the city, so much so, that Muslims number over 300,000. Mexicans number 400,000 throughout Michigan, but most work in Detroit . As the whites moved out, the Muslims moved in. Today, you hear Muslim calls to worship over the city like a new American Baghdad with hundreds of Islamic mosques in Michigan , paid for by Saudi Arabia oil money. High school flunk out rates reached 76 percent last June, according to NBC’s Brian Williams. Classrooms resemble more foreign countries than America. English? Few speak it! The city features a 50 percent illiteracy rate and growing. “By any quantifiable standard, the city is on life support. 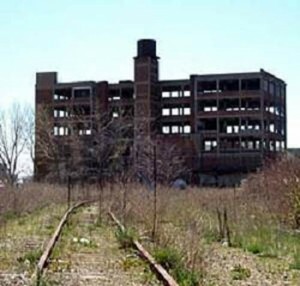 Detroit ‘s treasury is $300 million short of the funds needed to provide the barest municipal services,” Okrent said. “The school system, which six years ago was compel led by the teachers’ union to reject a philanthropist’s offer of $200 million to build 15 small, independent charter high schools, is in receivership. The murder rate is soaring, and 7 out of 10 remain unsolved. Three years after Katrina devastated New Orleans , unemployment in that city hit a peak of 11%. 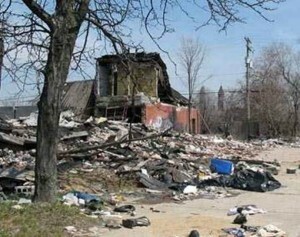 In Detroit , the unemployment rate is 28.9%. spawned out of the Muslim ghettos of Detroit . Illiteracy plus Islam equals walking human bombs. France with train bombings, subway bombings and riots. As their numbers grow, so will their power to enact their barbaric Sharia Law that negates republican forms of government, first amendment rights, and subjugates women to the lowest rungs on the human ladder. We will see more honor killings by upset husbands, fathers, and brothers that demand subjugation by their daughters, sisters and wives. Muslims prefer beheadings of women to scare the hell out of any other members of their sect from straying. country, and way of life. I PRAY EVERYONE THAT READS THIS REALIZES THAT IF WE DON’T STAND UP, AND SCREAM AT WASHINGTON , AND OUR STATE, CITY, AND LOCAL LEADERS THIS IS WHAT AWAITS THE REST OF AMERICA. IF YOU FOLLOW THE NEWS AT ALL YOU KNOW THIS HAS HAPPENED IN ENGLAND , AND FRANCE AND SPAIN. Who is Frosty Wooldridge ? Is he an anti-Catholic Church eugenics proponent?? Is there another way to view Detroit’s future? Wow. What a racist and superficial commentary! There’s absolutely no mention of how rising labor costs, created by the labor unions, forced the auto manufactorers (who comprised the majority of the economic viablity of Detroit) to relocate to other geographies (china, mexico, etc.) in order to remain competitive in the very industry created in Detroit! Last I checked, it was the heads of these companies who, in order to keep costs down and profits up, decided to NOT take care of their own workers as the industry developed which spawned the need for labor unions to begin with. Then, (oh no, God forbid mistreated workers stand up and fight for themselves) when labor unions fought for fair wages and decent working conditons, and won, it was the heads of the companies who decided to move their operations into more “business friendly” (read lower labor costs) areas of the world thereby effectively siphoning away Detroit’s economic viability. How easy it is to blame the minorities, the less educated, the less fortunate and the “different” (read non-whites as this article insinuates) when in reality, Detroit’s demise is a great example of what happens when so-called “leaders” of a community (buisness, civic or otherwise) decide that making profit is more important that making a community. It is a classic case of “cut and run.” The Detroit model is easy to replicate anywhere. All you have to do is create an industry in a community; then attract, hire and import as cheap and unskilled a labor force as you can (Mexicans, blacks, Muslims, uneducated, etc.) so you can make as large a profit as you can. Then, over time, once the workers wise up to how underpaid they are and demand higher wages and better work conditions, fight them every step of the way (this also creates the added benefit of “poor quality” in the finished work product as animosity builds between the workforce and management by the way). Then, once they win and your labor costs skyrocket, just pack up your business and leave. Only then can you leave an unskilled, uneducated and now unemployed workforce behind to fend for itself. It’s that simple. Stating facts is now “racist”. Definition of “racist”: Someone making an argument a liberal cannot logically refute. Previous post: Question I was asked on Relevant Radio today: What Should we Think of the Taize Prayers?